Second annual report created by visiting professor David Clark. Following a number of proposals from the Irish Hospice Foundation research committee and Irish Universities on the development of a visiting professorship in Hospice Studies an appointment was made in November 2005. 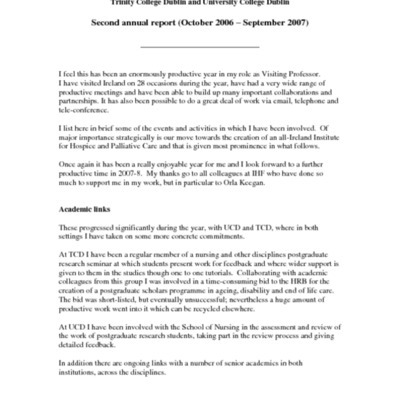 Professor David Clark, “David Clark: Second annual report (October 2006 – September 2007),” Archives Hospice Foundation, accessed April 22, 2019, http://archives.hospicefoundation.ie/document/1694.